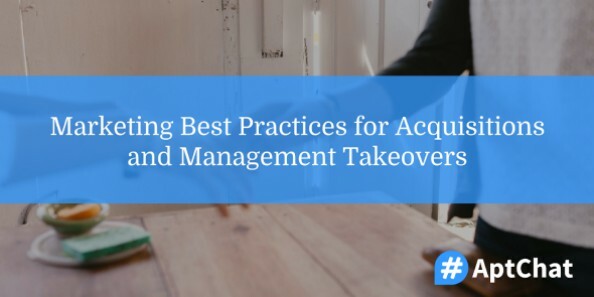 In the event of an acquisition or management takeover, thoughtful planning and organization pave the way for a smooth transition. Q1: What are some of the most important marketing considerations to keep in mind before/during/after a property acquisition? Q2: Is there an ideal schedule for when you need to complete certain marketing tasks? How do you approach/manage that schedule? Q3: What are some things you can do to make the transition go as smooth as possible (from either side of the transaction)? Q4: Thinking digital, how do you leverage anything that was working well (reviews, SEO, social, etc.)? What are some tips here? What are some of the most important marketing considerations to keep in mind before/during/after a property acquisition? @Marketing_Mommy true- this is only if everything will remain the same except mngmt co.
@AptChat Not always- it can be a great project to reinvent the brand. Depends on the overall objective for the acquisition. @Marketing_Mommy @artchickhb @AptChat So true. Are you typically keeping in-place teams or using your current employees? Is there an ideal schedule for when you need to complete certain marketing tasks? How do you approach/manage that schedule? What are some things you can do to make the transition go as smooth as possible (from either side of the transaction)? Thinking digital, how do you leverage anything that was working well (reviews, SEO, social, etc.)? What are some tips here? @AptChat Learn as much as you can about the programs that are working, and determine if they fit in your budget. Keep up with what works! Special thanks to Lori for being our guest moderator this week. You’re welcome back any time! Our next #AptChat is slated for Tuesday, October 25, 2016 at 12 pm Eastern. We’ll be discussing philanthropy and social good, and how apartment companies can make a difference in the community. In the meantime, be sure to sign up for #AptChat updates to get these recaps and more delivered straight to your inbox!